This entry was posted in Amazon, Author Earnings Report, Barnes & Noble, Barry Eisler, Borders, Bouchercon, Boyd Morrison, Downton Abbey, Joe Konrath, kindle by James Scott Bell. Bookmark the permalink. When possible I buy epub versions from Smashwords or Kobo to read on my Android tablet. But not the Adobe-protected ones from Kobo. B&N Nook is my second choice. I have only a few books for the Kindle app on my tablet. I like to own my ebooks, not have them at the mercy of some big brother. For a lot of reading, paper books are superior. Much easier for flipping back and forth. I recently switched to a paper version of _The Brothers Karamazov_ for that reason. And layout is a problem for things like poetry or computer code, though Nook now has something called Page Perfect. I have Jim’s Plot & Structure in the Page Perfect format. It’s more like reading a pdf in that it gives exact page replication. But you don’t get the text flow that epub and Kindle have. It’s nice in portrait view on a 9×6 tablet. But not so great in landscape view. Just checked the Nook app on my iPhone and Plot & Structure doesn’t even show up there. Nor do a number of others, even though they’re not in the Page Perfect form. I like that Page Perfect idea, Eric. And yes, when you read a big book like The Brothers Karamazov (perhaps the greatest novel ever written!) you can indeed flip back to physical pages easier … and we have a mental picture of which side of the book the passage was on, and what relative position on the page. OTOH, a keyword search in an e format may work better sometimes. Like everything in life, plusses and minuses, and the deciding factor is preference. My first publication was with a digital first publisher, and this was years before the Kindle. People read on PDAs. I had an eBookWise and loved that I could read in bed with its back light and turn pages with a press of a button. Digital books got their start with Ellora’s Cave because women (or men) who read erotica preferred the privacy aspect of buying and reading without going to a bookstore. My first traditionally published book was with Five Star. When they remaindered it, Amazon had just released the Kindle and Konrath was touting it. I figured I had nothing to lose so I took my remaindered book to Amazon. And, little known fact, one that Konrath probably doesn’t remember, but at a conference (I think it was SleuthFest), I showed him my eBookWise and he was intrigued and said that was the way to go. I never knew about the eBookWise, Terry. Another example of how the free market operates, even when you have a nifty product. My first computer was a Kaypro. Man, I loved that machine. 64k of RAM, mind you. And portable! But then DOS replaced CP/M and the little beauty was doomed. I resisted getting a Kindle for several years. Now I’m on my second one and prefer eBooks. As you pointed out in your post, the ability to take a “library” with me while traveling is a plus. I never considered a Nook, although a friend tried to talk me into it. Amazon is where I shop the most, so it made sense to go with a Kindle. I do, however, offer my books in both Kindle and ePub formats. My wife gave me a Kindle for Christmas, 2010 … my kids gave me a cover. I immediately started loading that puppy up with Jack London, Dickens, Twain. Then taking a plane trip where, for the first time ever, I did not take along a printed book. I did have to learn about keeping the battery charged, however. I love this, Jim. It reminds how hooked I was on print but now am addicted to my kindle. I love shopping at 3am. (Don’t ask) I also use it for a phase of my edits to make notes on typos or plot inconsistencies. I still buy print books for research. I prefer flipping pages & margin notes on important stuff. Another thing I love about ereaders is the changeable font. I bought a kindle for my mom (89 yrs old & going strong). She loves the font feature, backlighting, & the lightweight device. There are days when I’m bleary-eyed after a long day & I appreciate the flex of changing fonts too. Print books can be a strain to read with small print, even in trade. Some print books are now a challenge for me to read when publishers try to pinch pennies by squeezing too many words on a page. I’ve also learned more about indie publishing & promoting. It’s great that authors have many options to publish. You’ve been a great advocate of this for a long time. Right, Jordan. Font size and page color options are major plusses. I’ve been places without my reading glasses, and upping the font on my phone lets me read, instead of squinting at print. I’ll chime in with another plus for the Kindle and the related apps and devices. You don’t have to hold it to read. Osteoarthritis in both thumb joints made it impossible to hold a book, especially trying to hold back pages on a small paperback. With hardbound books I could at least lay them in my lap, until I needed reading glasses. Then they were too far away. I tried book stands and anything suggested. None worked well. Then came the Kindle and I’ve never looked back! I have since had surgery to replace the disintegrated cartilage in my thumbs and I can hold a book for short periods, short being the on going problem. Thus they will never replace my Kindle. However, as an author, I publish both print and digital. I have a few fans who prefer the print books and they are nice to give as gifts. After all, it’s good to have choices. Good point about the various ways to read, Cecilia. When I’m eating, alone, I can read on my phone or Kindle without having to hold a book. Good point about physically not having to hold the book. The other reason I like not having to hold my e-reader is I have to spend way too much time seated at a desk (work AND home) and sometimes I set the e-reader on the back of my recliner and stand while I read. It’s a nice break. I’m rather proud of it, Mike. I’ve been blind since I was five-years-old, and e-books are the only way I can read–unless I want to wait months for a single book to be brailled. I my first semester of college, I had an English who was so adamant about print books she would yell at people for having them on the computer. Once she started a discussion about it, and I had enough. ?Do you not want me to be able to read!? I yelled at her and didn’t let her speak. There are so many people who would not be able to read without e-books, and it makes me furious that someon would denounce them to my face. What hurts more, though, is that I love print books. I love holding them flipping through their pages, and walking through bookstores. I just can’t Fing read them. That’s an aspect most of us have never considered. Thanks for sharing it. First, can you pretty please tell me the title of the 2-volume set you bought on Grant (i.e. is it simply his name or something else)? I LOVE reading that stuff. I came late to e-readers–didn’t get my first Kindle until the beginning of 2011. I was smitten from the moment I got it & that hasn’t changed. I can carry 700-800 books (at least) around with me wherever I go. That was a physically impossible feat prior to 2011. And that’s a freedom and empowerment I don’t ever want to let go. The other benefit I had not anticipated but am grateful for–my 50 something eyes can handle e-books better than print books these days. With the exception of some non-fiction that does not have graphs & charts well suited to e-reader format, e-readers save my life in the vision department. Another HUGE area where e-readers have helped me is in the area of textbooks. I want to be a permanent student but can’t afford the tuition. But you CAN either rent or buy both physical AND E-textbooks to keep studying in the areas you love. Also, up until roughly a year ago, you could find a TON of long out of print books for free on Kindle. The covers were nothing special and it was the book roughly formatted to e-reader and nothing else, but I downloaded a ton of free historical content that way, jumping up & down in glee the whole time just salivating over having so much history at my fingertips. I don’t see them as much any more (but in fairness life gets crazier & crazier so I’m not searching almost daily like I did in the early years). But there are still a ton of books available for from $0.99 up to a reasonable $5-6 (my arbitrary cap, nothing more). I’ll pay on the higher end for an awesome history book and have done so quite a bit. I still continue to be amazed at how high trad publishers keep the cost of fiction e-books. Also, let’s not forget the amazing Project Gutenberg, which is daily adding to its free library of public domain books, downloadable in various formats. If I could take this topic one step forward with what I’d like to see improve (speaking in Kindle, since that’s all I know). I wish they would improve their highlighting feature. I read mostly non-fic, and I am a mega-highlighter (just as I am with print books). And I use different color highlights for different reasons within the e-text. I use the blue to highlight author names, book titles or websites that I want to go back and write down to follow up with later. I use pink for “HEY! REMEMBER THIS! VERY IMPORTANT!” And then I use the yellow and orange to highlight material I want to make general notes from. THAT’s the great news. The bad news is, let’s say I highlight something in blue. Then I read a few lines down & see something else I want to highlight in blue. You can’t highlight in blue again–it won’t let you select the same color. You have to highlight in the wrong color in order to be able to go back and highlight in the RIGHT color. That is a hassle. I also have not found a way to un-high if I accidentally do a section I didn’t mean to. And if I highlight a few words in one color and try to highlight the next immediate section in another color, it will only let you highlight in the color the prior section was in. In short, there are still things they could do to make reading/studying on Kindle a faster, more precise experience. And I’ll bet they’re working on it …. My wife and I are both lifelong science fiction fans, and longed for what used to be a called a “cyber book” for many years. We almost bought Sony Readers, but waited for the price to drop. Then Amazon released the Kindle. We waited for another long year, and then in the fall of 2008, bought our first Kindle, and then a few months later, our second, so we could each have one. We’ve owned four generations of Kindles since then. I still love paper books, but reading on an e-ink display is so convenient. Best of all, books all weigh the same. 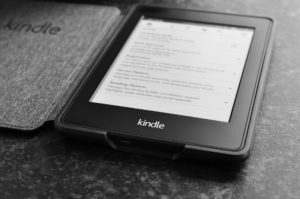 Amazon and the Kindle made digital self-publishing possible-they opened up a marketplace to so many of us. I’m very grateful for that. While there’s lots of uncertainty about the future (after all, it is the future), I’m loving my Kindle and the opportunities it gives me, as a reader and a writer. …remember when there were no cell phones? Not that long ago. Sue Grafton keeps Kinsey in the ’80s. Probably takes a lot of work not to slip up with the technology. I would think placing a story in ’90s or 00’s you would have to research the technology almost to the month. “KIndle is just a young whippersnapper,” says Marilynn who has an ebook that will be 20 years old in a few months. Long before the Kindle, there was the Rocket and half a dozen other ebook-specific readers as well as the Palm Pilot. Long before there was self-publishing, there were small ebook publishers who braved the wrath of the big publishers and the traditionally puiblished authors and author organizations that threated them and their authors like sh*t. I have arrows scars in my back to prove it. Palm Pilot! I remember when that was THE thing. I missed the Rocket. Looked it up on Wikipedia. Wow, it could hold up to 10 books! It was fun reading all the comments and remembering the days before Kindle. I just want to say it’s quite appropriate that Kindle is celebrating it’s 10th birthday on my mom’s birthday. She died two years ago at 97. But, she was a huge Kindle fan. In her late 80’s and 90’s, when most older people are shying away from technology, my mom wanted a Kindle. I bought the first one for her, the first generation Kindle. She read on that one until the end of her life. Later, I bought her a Kindle Fire, thinking she’d like the features. But, she still preferred the old one. The touch screen was hard for her. Nonetheless she mastered it and ended up reading books on both. It was funny, months after she died, I book appeared on her Kindle. (Obviously she’d pre-ordered it). But, it was a bit eerie. Indeed, as many of the comments pointed out, Kindle is a great resource to people who can’t see as well, want to read in dark places, can’t hold books or want to carry around great bundles of books. Nothing beats the e-Reader. Nonetheless, my books are published as both e-Reader and print because I still have people wanting print. Not as many, but they are still out there. And, I love to have events and actually sign books. Still can’t do that with Kindle. My children gave me a Kindle for Mother’s Day. I love it, though I don’t use it as much as I thought I would. I like to be outside and paperbacks are much better for getting caught in rainstorms (dry them out, replace if I like them, toss if I don’t). We were out of power for a week with Hurricane Irma. I was grateful for my paperbacks. For my day to day, I use the Overdrive app on my phone. I can get library books through that, both e-books and audio. I read faster than my budget allows. Overdrive is terrific, Cynthia. I use it all the time. And I love my paperbacks. They are stuffed in bookcases all over the house and garage. I just can’t part with them! I know I should, I know it makes sense. I guess it’s like hanging on to those beloved buggy whips. Great story, Dave. The pastor could have riffed a sermon illustration based on Psalm 38:10: My heart pounds, my strength fails me; even the light has gone from my eyes. It was in 2012 and I went shopping with my roommate at Best Buy. She wanted a Kindle. I was not interested in Kindle at all, but I had just received some back pay and wanted to buy a TV. The Kindles were on display and I went over to look at them out of curiosity and to kill some time. When I saw how many books they would hold and how I could adjust the font, I fell in love. I bought the Kindle Touch that day and I am still using it. I have almost the maximum 1300 book capacity right now. I think I need a 12-step program for Kindle. Whenever I see a discounted book that sounds good, I will buy it. Oh, look, this will never be this price again! (Of course, it will, but this is me justifying the download). I rarely read print anymore due to my failing eyesight. I usually stock up up on samples. If those first page is grab me, there is a sale. I do most of my reading on the Kindle app, but I’d love to have a Kindle device (need to ask Santa this year). As others have mentioned, you can’t beat the lit background. With the boon of e-books came the ability to buy more books due to price. Our TBR pile is never-ending, but that’s a good thing. The only real issue of the digital era is pirating. Never has it been easier to steal an author’s work. I received my Nook as a Christmas gift many years ago. I love it but find book availability not as good as Kindle. I think I’ll drop “hints” this Christmas for a Kindle update…. However, I must have hard copy books and I love browsing book stores.